Why Be Curious? The ‘NM’ stands for Nerello Mascalese, native to the slopes of Mount Etna, but also found in the northwestern part of the island. It’s spicy and complex, with a little of that warm Scirocco wind from northern Africa. Esposizione / Exposure: East / west. Vitigni / Varieties: Nerello Mascalese. Età delle viti / Vine age: Ten years old (planted in 2005). Metodo agricolo / Agricultural technique: Certified biodynamic. Zolfo / Sulphur: 30 mg/L total, 8 mg/L free. 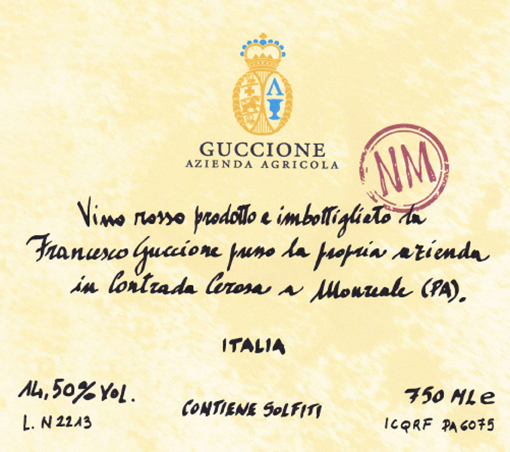 Produzione annua / Annual production: 4000 bottles, in cases of 6 bottles each. Gradazione alcolica / Alcoholic %: 14.5%. Tappo e bottiglia / Closure and bottle: Natural Sicilian cork, 750 ml Burgundy bottle.